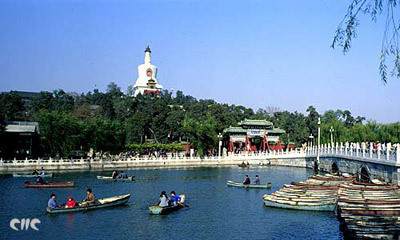 West of the Forbidden City and Jingshan Park, Beihai Park is one of the oldest, largest and best-preserved of the ancient imperial gardens in China and it is conveniently located in the very center of Beijing. Beihai literally means "Northern Sea". There are also corresponding "Central" and "Southern Seas" – both are located in an area called Zhongnanhai. This region is also quite famous because it houses China's paramount leaders. Beihai's ancient gardens, over 1,000 years old, reflects not only a classic combination of the grandiosity of Chinese northern gardens and the refinement of the southern gardens of China, but also perfectly integrates magnificent imperial palaces with solemn religious constructions. Towering over the central islet is the 36m high White Dagoba, which was built to honor the visit of the fifth Dalai Lama in 1651 and is one of the more impressive sights on the skyline. Local residents can be seen using the space for Tai Chi and water calligraohy, using large brushes and water on the stone cobbles. General entry ticket: 10 yuan; another 2 yuan for the Circular City and 10 yuan for the White Pagoda. Bus No.s 13, 42, 105, 107, 111 or 118 stop at the back gate.